Americans will acknowledge that most of the electronics including the iPhone, laptops, desktops, mobile devices, etc are made in China. Why are these products successful? Because we are familiar with the brands. When we shop for items, we look for brand names - companies whose products we (or someone we know) have used before. They have proven reliable. If that product is made in China, we will still buy it. Because of the brand name, we are confident that the product will work as promised; but if it is defective, we're also confident that the company will stand behind their product. On the other hand, if a similar product is on the shelf next to it but is built in China by a Chinese company, Americans would be less likely to buy it even if it is less expensive. Why? Because the brand is unfamiliar and we are not sure of the quality. Right or wrong, that is the American mindset. China is becoming the 'workshop to the world' as Britain was at the beginning of the first industrial revolution. The US became a manufacturing giant and overtook Britain at the turn of the 20th century. Now, China is rising along with other BRIC nations while the developed economies in America and Europe are having difficulty adjusting to this shift. It is not fair that ALL Chinese companies be branded the same. But please keep in mind that in the 1960's and 1970's, Americans had negative feelings for products "Made in Japan". Over time, companies such as Toyota, Nissan, Honda, and Mitsubishi (to name but a few), distinguished themselves. Now, products made in Japan are known to be of the highest quality. But this took time. One day, the same will be said of China. We must look at the long-term. But, that is a major difference between East and West. I lived in Asia for four years and I have done much reading about Eastern philosophy, much of which has been adopted into Asian business philosophy. From this I have learned that Eastern thought looks at the long term, just as we do regarding molds. But, Western companies are driven by profit margins, by the current stock price, by what is happening in the short term. We know this can turn out badly (think of Enron); but companies and the people who run them are judged on what is happening today. 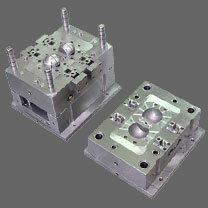 In fact, a common saying with mold makers here is, "You're only as good as the last mold you built". Unfortunately, this is the mindset here. Perhaps it will change over time. One of the keys to Japan's success was their adoption of Deming's quality philosophies. Having high quality standards in place and living that philosophy can set a company apart and distinguish them from their peers. This can change minds and open doors.